(Seychelles News Agency) - A crowd of excited children jostle against a new enclosure at the Wildlife Conservation Society’s Bronx Zoo in New York, curiously gazing at a tortoise extending a long, wrinkly neck to pluck leaves off a nearby bush, its toothless beak opening to reveal a surprisingly pink tongue. But this tortoise is no garden variety – it is one of two male giant Aldabra tortoises (Geochelone gigantean) that recently arrived at the zoo on loan, one weighing about 180 kilograms and the other tipping the scales at 270 kilograms. The slow-moving giant reptiles evoke comparisons to dinosaurs, as their wise old eyes peer curiously at the world around them and their scaly, clawed legs ponderously drag their heavy shells around in search of greenery. If giant tortoises could talk, one wonders what they would be able to tell us of times gone by. 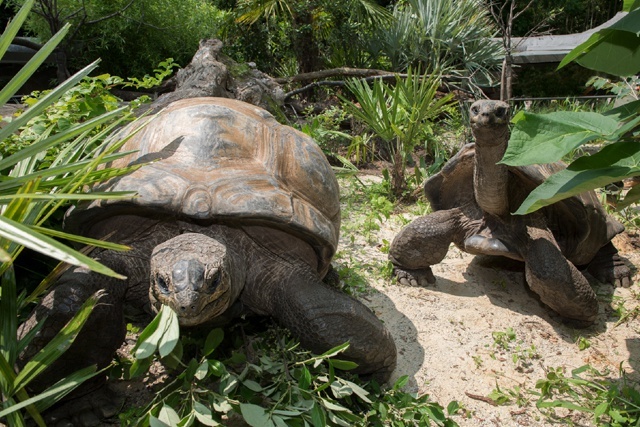 Both of the new arrivals at the zoo are possibly the oldest living residents in the area, at an estimated age of between 100 and 150 years old. They may even be older than the zoo itself, which was first opened in 1898. Capable of reaching around 200 years of age, many might be curious about the giant tortoise’s secret to longevity. Aldabra tortoises are one of only three remaining species of giant tortoises; another being the Galapagos tortoise, a few of which the Bronx Zoo also has on display to curious onlookers. A small population of Seychelles giant tortoises can still be found in captivity on Silhouette Island in Seychelles, and the breeding group remains the only chance to save the species from complete extinction. A Seychelles giant tortoise named Jonathan is thought to be the oldest living creature on the planet, who, at an estimated age of 182, lives happily on the British overseas territory of Saint Helena. The Aldabra giant tortoise on the other hand is found in the wild on Aldabra, the world's second largest atoll and a UNESCO world heritage site, also in the Seychelles. Around 150,000 Aldabra giant tortoises still roam the island, outnumbering the human population of 90,000 of the entire Seychelles archipelago. In an email interview with Don Boyer, curator of herpetology at the Bronx Zoo, it was revealed that the new arrivals’ exhibit, located just outside the famous Zoo Centre, resembles their natural habitat with a sandy substrate, lush vegetation, and a freshwater pool. 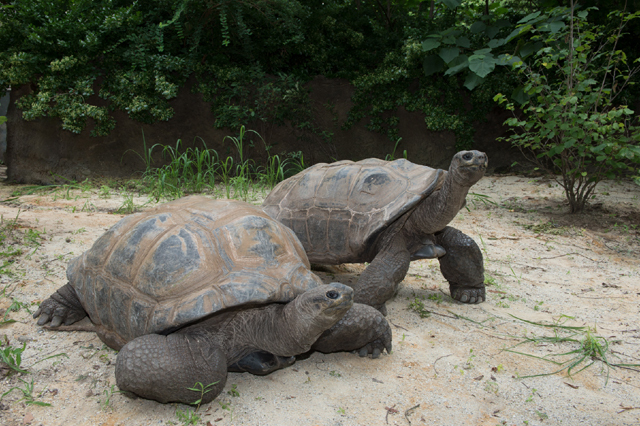 The herbivorous Aldabra tortoises are fed a diet of leafy greens, a variety of vegetables, hay, grasses, small amounts of protein and a multivitamin and mineral supplement, said Boyer, who added that the cold-blooded reptiles, more at home in a tropical climate, would be kept warm at the zoo irrespective of the weather. The Wildlife Conservation Society operates five wildlife parks in New York City: Bronx Zoo, Central Park Zoo, Prospect Park Zoo, Queens Zoo, and the New York Aquarium. Together, they attract more than 4 million visitors per year. The Bronx Zoo alone has more than 6,000 animals representing more than 600 different species.